About the artist: My name is Virginia Laurie, I am 18 years old, and a senior as Saint Mary’s School in Raleigh, an all girls school that has been around for over 175 years. While I don’t normally do digital art, it felt fitting for this piece called “Modern Eve” in reference to the Bible story of Adam and Eve. Like Eve, she is eating an apple, representative of the Original Sin. 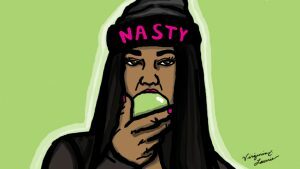 However, she is unapologetic and wears a hat that reads “nasty” in reference to the phrase “nasty woman” from the 2016 election that became a call of solidarity among liberal women.